Tuesday, November 14th, I went on another simploring tour. I visited Aspen Fell Memories following Inara Pey’s blog “A winter’s return to Aspen Fell in Second Life“. Aspen Fell Memories is designed and owned by Aspen Fell (aspenfell), who had already 3 other sims before as I could learn from Aspen’s profile. Aspen Fell Memories is the actual design, the others were closed. I visited Aspen Fell Endless in 2015 and wrote about it here. Aspen Fell Memories is devided in two parts, an Autumn part and a Winter part. At the landing point you can turn westwards to a portal leading to the Autumn part or eastwards trough another portal into the winter part. Both parts are buildt on high cliffs. I decided for the Autumn part first and went up to the cliff. You have beautiful views from up there as Aspen Fell Memories is embedded in a perfect sim background. There are several places to sit and cuddle or to mediate. When you walk to the end of the cliff you come to the ruins of a farm – and it begins to rain. At one wall you find the inscription “The best thing about Memories is making them“. Just closeby is a nice and cosy tree house where you can warm up. Around the Autumn part of Aspen Fell Memories is a large beach which offers again nice spots and views. The Winter part is different. It’s cold and snowy. This part is dominated by a large stone bridge that seems to be the rest of a bigger building that might have been here before. On the brige you find benches to rest and souvenirs like a love sign or a street sign of Paris – Memories. Across the bridge is a residential home and beyond it an event spot, which is not in use because of the season. But there’s more to discover. Just before your reach the bridge there’s a living room without a house. It looks a bit odd in this cold cold environment but offers particular views for taking a picture. Above the landing point the both cliffs are connected by an old railroad and on the tracks are 3 old good waggons. Again they have found a new usage which is a bit bizarre. There’s a piano and a well-laid table for a romantic dinner. And inside of one of the waggons is a place to cuddle. And all this in winter and outside – and me wearing some shiny summer clothes! Again this offers nice settings for taking pictures. I’m pretty sure there’s much more to discover at Aspen Fell Memories. 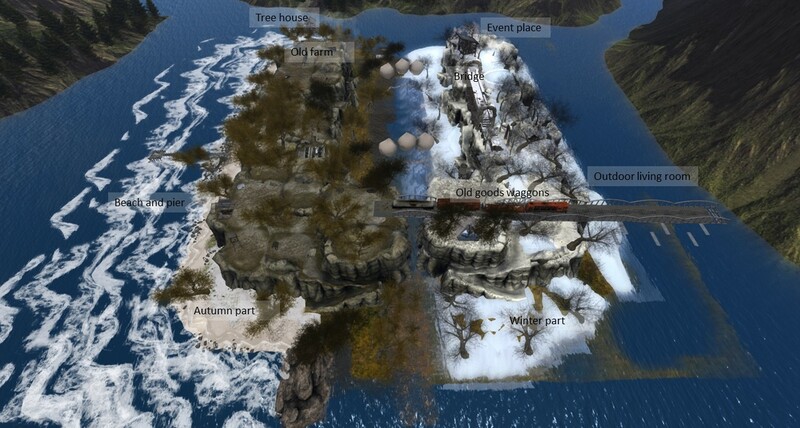 It’s a well designed sim and different and again a prove of the beauty and creativity you can find in Second Life. Thank you Aspen for providing it to the public!